My name is Jasmina, also short Jassy (real name) and JassysART (pseudonym). 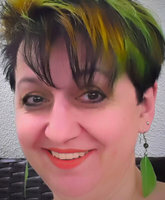 I am a German digital artist and graphic designer. I also offer eBook/Book/BluRay/CD Covers. I live in Germany. My expertise is digital art: digital painting, photo manipulation, wallpaper, book cover, 3D art and graphic design. If you want to contact me, you can send me a message. I have Yugoslav origin. I speak German, Serbian and English. Ich bin eine deutsche Digitalkünstlerin und Grafikdesigner. Ich biete auch eBook/Book/BluRay/CD - Cover an. Meine Expertise ist digitale Kunst: digitale Malerei, Fotomanipulation, Wallpaper, Buchcover, 3D-Kunst und Grafikdesign. Ich spreche Deutsch, Serbisch und Englisch.